Who here doesn’t jump for joy when finding a good, value-for-money place to eat when they travel? Crave and Shop is such a place in Baguio. From the outside, it looks like a plain, convenience store with a weird name, but it’s that quirky, hidden café-slash-concept-eatery inside. I’m so glad we found it, and by accident, too. We were out walking in the streets at around 6pm, looking for a better transient room offer for two people from our nasty room in Quezon Hill, when we ended up hungry and clueless in this oasis of a convenience store. We were going to buy quick snacks but soon found out that they served food. Real food. With prices ranging from Php 30-120, a hungry, lost, and cold Baguio traveler can fill up on Filipino breakfast food such as tocino, longganisa, etc, Mexican cravings like nachos, American favorites such as chicken wings, potato-wedge salads, and the like. It actually looks like the eatery part was an afterthought to the convenience store, because it’s just to one corner, but we didn’t mind. At prices so cheap, the serving sizes were very decent, and thoughtfully presented. We were pleasantly surprised by the food, and I think you will, too, if you know what you’d get for the same price elsewhere. 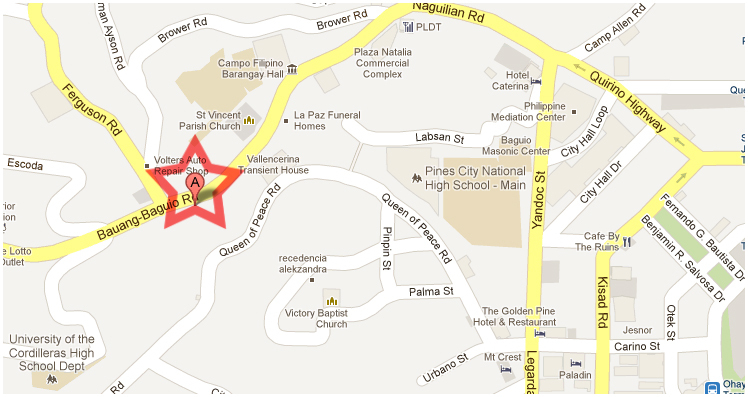 Unfortunately, we were too famished to think of taking pictures so we don’t have pictures to show, except a map below. Crave and Shop map – about a two-minute drive from the city center. The best part, too, is that it runs 24 hours. Perfect for the midnight-snack -craving budget-traveler. More power to Crave and Shop and their accommodating cashier lady. Til the next Baguio craving! ← Baguio: Fresh Strawberry-Everythings, Anyone?